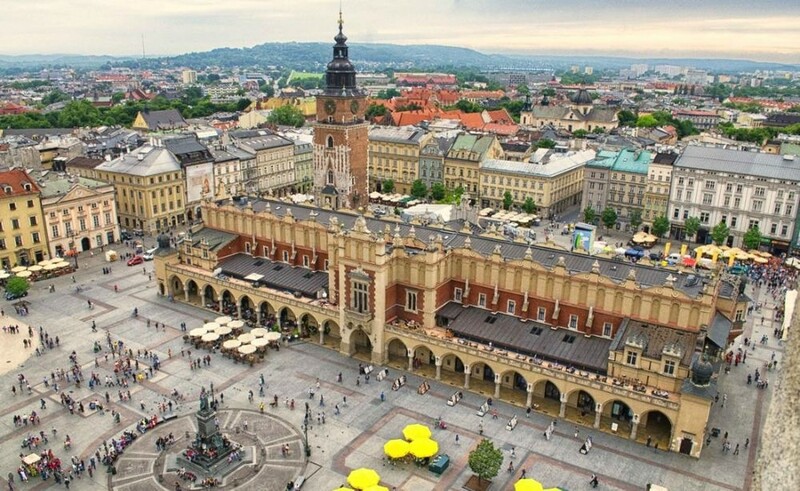 Founded in the city of Krakow in 1364 by Casimir III the Great, Jagiellonian University is the oldest University in Poland and its most reputed academy. Most stories have their villains, be it a metaphorical dragon, or a down to Earth ailment, while few are the lives untouched by suffering. On the human scale, few diseases are more feared than cancer. The unseen foe of the body turning against itself, cancer’s is a story told again and again, transforming itself as times change but always one of struggle and often that of victory. It was exactly with fighting evasive enemies in mind that Horizon 2020 opened a call to finance research on rare diseases. As an often neglected area, the lack of clinical and basic research on rare diseases many times results in a hard to solve therapeutic vacuum. A group of twelve outstanding European partners got together and was awarded funding under the project UMCure 2020 — a venture designed to specifically tackle uveal melanoma (UM, a rare disease affecting 5 to 6 individuals per million) with patients placed right at its centre. Officially started in January 2016, UMCure 2020 has a very clear objective: to develop therapies for metastatic UM, a clinical prognosis with dire and unmet therapeutic needs. Founded in the city of Krakow in 1364 by Casimir III the Great, Jagiellonian University (JU) is the oldest University in Poland and its most reputed academy. 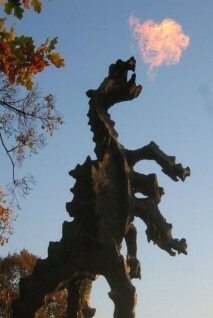 JU happens to share its Krakowian hallowed ground with the legend of the Wawel Dragon, fear made imaginary flesh and later fire-breathing bronze, an intellectual alchemy JU strives on to this very day. The Wawel Dragon, a perennial symbol for an evil that needs to be vanquished. Initially created as a Studium generale — the name attributed to medieval universities as places of higher learning in the arts and the higher faculties of theology, medicine and law — JU later attracted the likes of Nicolaus Copernicus, Pope John Paul II and literature Nobel laureate Wisława Szymborska. Today, JU is divided into 15 faculties covering all fields of knowledge, housing some 4.000 academics and attracting an international and multicultural body of students exceeding 40.000 talented minds. Based on its solid medical reputation, the JU team brings a set of invaluable assets to UMCure 2020. As a major referral centre for ocular melanoma — where ophthalmic cancer diagnostics and treatment place JU at the very cutting edge of the field — up to 400 new UM patients are treated every year (primarily at the Department of Ophthalmology and Ocular Oncology, which also carries out research on UM, permanently striving to raise the standards of care, diagnosis and treatment of this disease). Equally essential for diagnosis but also for scientific research on UM, the Department of General, Oncological and Gastroenterological Surgery participates in UMCure 2020 by contributing with the collection of tissue samples from metastatic UM patients. Given its strategic position as a centre for UM diagnosis and treatment, as well as house to a major tissue biobank, in the context of UMCure 2020 JU is primarily involved in collecting excess tissue samples from primary and metastatic UM tumours, whilst employing these to develop novel tools for research on UM biology. These tools include patient-derived cell lines (to probe UM biology in vitro — in the petri dish, so to speak) and xenotransplant models in immunodeficient mice (also called Patient-Derived Xenograft — or PDX — models, where cancer cells are transplanted, or grafted, from one species to another, allowing scientists to study how UM develops and spreads in vivo within a physiological context). JU is also involved in disseminating the subsequent results and contributing towards drafting new patient care guidelines and patient networking. 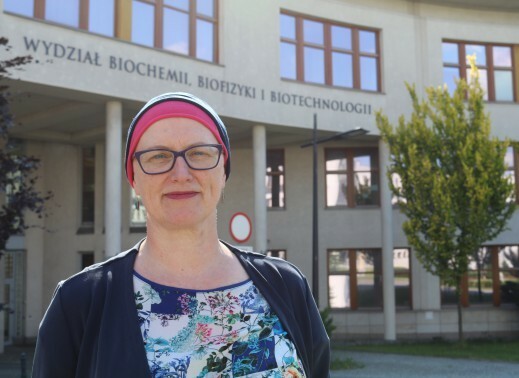 Taking together the above mentioned accessibility to patient samples and expertise in using this precious resource in the development of animal models to study UM biology, UMCure 2020 counts with the essential contributions of two leading researchers: Professors Bozena Romanowska-Dixon and Martyna Elas. Together, they bring patient sample collection into an efficient and perfectly harmonized pipeline at the forefront of biomedical research. Given this wide range of clinical and fundamental work, JU clinicians and researchers participate in UMCure 2020 within several different dimensions. First and foremost, by optimizing the collection, processing, storage and transport of UM samples and data, JU is involved — together with other UMCure 2020 participating institutions — in establishing a solidly networked European UM virtual biobank. As an integral part to this strategy, JU maximizes and enhances the available collection of matched UM samples (primary and metastatic tumour samples, as well as blood, from the same patient). Given the clinical relevance of the four UM referral centres participating in the UMCure 2020 consortium (aside from JU, the Institut Curie, the University of Liverpool and the Leiden University Medical Center), the proposed biobank should become one of the most important metastatic UM sample collections in the world. This will surely prove to be an invaluable resource in characterizing and treating metastatic UM — the primal objective of UMCure 2020 — as well as in developing next generation UM preclinical models recapitulating the physiopathology of UM progression and metastasis formation, that is, reproducing closely how the disease progresses in a patient, (as most UM models established until now focused on primary UM samples due to low accessibility to metastatic UM samples, an issue the European UM virtual biobank helps bypass). All this is accomplished by teams stemming from different JU faculties and departments. 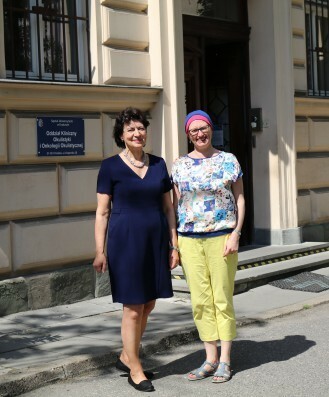 Professors Bozena Romanowska-Dixon and Martyna Elas outside the Ophthalmology and Ocular Oncology Clinic, at JU. 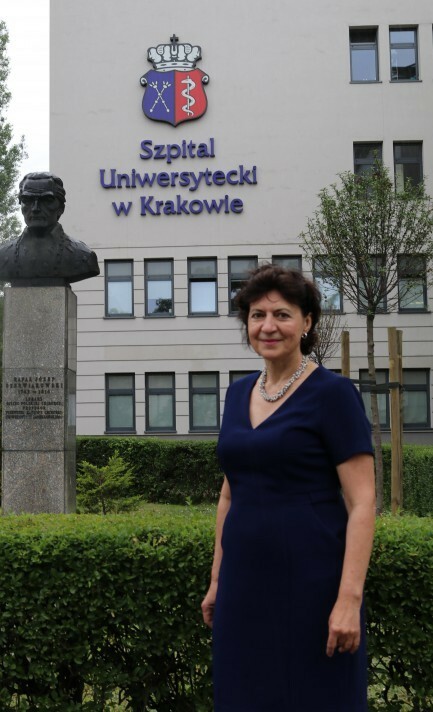 Professor Bozena Romanowska-Dixon, an Ophthalmologist and Head of the Department of Ophthalmology and Ocular Oncology (the leading centre of its specialty in Poland, and hosting the first proton radiotherapy unit in the country), brings to UMCure 2020 her expertise in UM diagnosis and treatment, and will spearhead UM sample collection at JU. Additionally, Professor. Romanowska-Dixon will liaise with other UMCure 2020 partners in formulating new guidelines for patient care. Dr. Martyna Elas, Associate Professor at the Department of Biophysics, has wide experience with cellular and animal research models, and is in charge of implementing UM PDX and cellular models in collaboration with Institut Curie, the Leiden University Medical Centre and the University of Leiden. The Department of Biophysics is part of the Faculty of Biochemistry, Biophysics and Biotechnology, which hosts research on contemporary biochemical, biophysical and biotechnological aspects of biological entities, ranging from the molecular to the cellular level, and has the highest Nature Index score (May 2016) for original research articles among all life science research institutions in Poland. Dr. Elas’ expertise is pivotal in developing new PDX mouse and zebrafish models — using metastatic samples collected from the UM referral centres and centralized by the UM virtual biobank — as well as in establishing ex vivo cultures from the created PDX models and developing genetically engineered mouse and zebrafish models to faithfully recapitulate the physiological evolution of human UM progression. 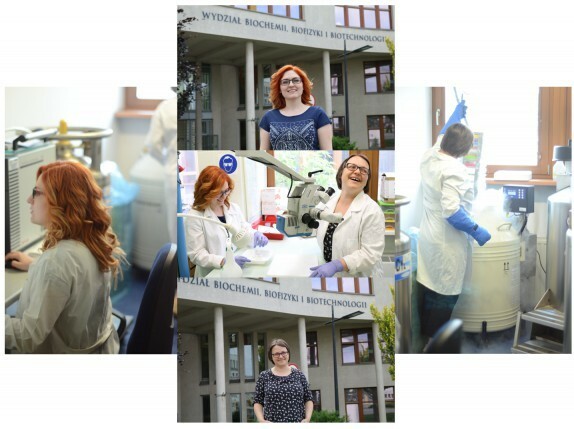 Dr. Katarzyna Jazynska and Dr. Malgorzata Szczygiel, JU biobank scientific staff. The clinical care and experimental reach at JU within UMCure 2020 perfectly mirrors the mission of this consortium: to bring UM patients, clinical practice and research, into one cohesive healing hope.